I feel fairly sure that the above shot was taken at the 5th National Coach Rally which started in Wigan and finished in Blackpool where this shot was taken. According to a Buses Illustrated report on the event it was a very foggy morning so much so that only 20 of the 47 entrants had arrived at the starting point in time, but due to the bad weather conditions the penalties made to late arrivals were discarded for this particular rally. The Fieldsend coach above was driven by J T Wareham and came second in the 30ft and under class mind you I found out that the year before Mr Wareham won National Driver of the Year award in the same coach. It is also interesting to note that TRJ 731 was one of only seven built prior to 1965 at the rally that year. Is this a typo or simply bad info? The Plaxton Embassy IV body was only produced for one season – 1964, not 1961. Thanks for that. I have to say, then, that either Bus Lists is wrong – which according to registration chronology looks unlikely – or it needs further investigation. I can say with absolute certainty that that is a 1964 body; the design was only produced in that year. Was it new in 1961, stored and not bodied until 1964? Was it involved in an accident and rebodied? Did Fieldsend’s do what Manchester Corporation did – have a block of registrations which covered about five years? (Highly unlikely). More questions than answers. [For what it’s worth, according to Bus Lists, all the "surrounding" Ford/Embassys were of the Embassy I type, only just introduced in 1961. Intrigued by your shot of Thames TRJ 731, not least because it carries a version of the Embassy body produced only in 1964, a fact which is clearly at odds with its registration (and, on checking a chassis listing) its date of manufacture. Presumably the original Plaxton body had been replaced by the one illustrated. Does anybody have details of the accident/fire/etc which made this necessary? Fieldsends’ livery was particularly unimaginative, cream with a black flash. This style of Embassy bodywork looks much better in a ‘proper’ colour scheme! There is obviously something not quite right here does anyone have any clues that may solve this mystery. First a minor correction. The body type is Embassy III not IV, but I agree that the model was only produced for the 1964 season (for which many people were very grateful). I have found another entry in Bus Lists Plaxton lists which may explain it, although if it does then it contains at least one typo. Sticking out like a sore thumb in a block of 1964 Ford 570Es, with registration numbers missing and chassis numbers in the L80 series, is 510E54371, shown as delivered to Victoria, Salford. This is the only entry on the site for that operator, which I’ve never heard of. Have to disagree with Tim Presley, this vehicle never operated with Victorias of Leigh-on-Sea who were an entirely different company to Hackett (Victoria Coaches) of Leigh, a subsidiary of Fieldsends after the Hackett family bought out Fieldsends and "reversed" their own company into it. The Leigh-on-Sea company was probably most famous for operating a pair of Bristol SC4LK coaches, later sold to Vagg of Knockin Heath. I owe an apology to Tim Presley for stating that the Hackett family of Fieldsends had no connection with the Leigh-on-Sea company known as Victoria Coaches. 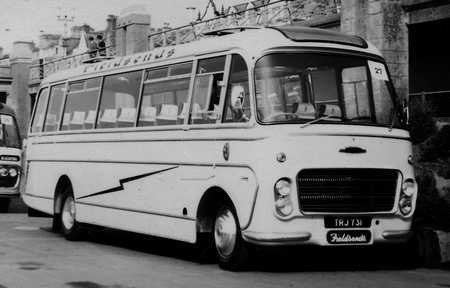 Further research shows that the Hacketts purchased three different Southend-area coach companies in 1958 and amalgamated them into Victoria Coaches (Leigh-on-Sea) Ltd, presumably taking the title from that of their company coincidentally based in Leigh, Lancashire. By 1964 the Essex company had been sold to a locally based proprietor, however, so my belief that the Ford had never run for the Leigh-on-Sea company is still correct. Incidentally, while the Fieldsends business and its associates (which also included Cash of Urmston) were owned and run by J. and W. Hackett, a Mr Hubert Hackett of All Saints in Manchester was running a parallel coaching empire in the 1950s including such companies as Timperley Coaches. Was he related to the other two Hacketts? No Hubert Hackett was no relation. Fortunately the PSVC recently published their information on buses with Salford registrations in their Journal, and this confirms that TRJ 731 was indeed rebodied. So nice to see a photo of TRJ 731 again. J.T.Wareham was my father and I remember the rallies well. Sadly pictures of that time are long lost. Dad started working with Wheatleys and stayed with the company when Fieldsends took over. re TRJ 731 it was in a rta in 1962 and rebodied in 1964 it was on the miners run going to Wigan to pickup miners for the new pit Agecroft. Fieldsends had 3 or 4 buses on this run. Re age of TRJ’s body.. not sure which year the 5th rally was.. but I do remember the 4th rally when J T Wareham (my father) won the coach driver of the year.. he not only won that, but 9 of the 10 classes that year… the only one he didn’t get was called the Cours d’Elegance I think for the smartest bus.. he said it was maybe due to his bus being older than the others.. if anyone has a link to the Eccles Journal/Manchester Evening News or any other article to this achievement I would be very grateful as a few newspapers carried the story with a pic of Dad and Mr Fieldsend with his trophies..or may have been a Mr Hackett not sure. I think your father would have been photographed with Mr Hackett as my grandfather and founder of Fieldsend’s Coaches died in 1957. If anyone has any knowledge and/or photographs about my grandfather J.W. Fieldsend I would be obliged and interested. Just got a 1960 reg Thames trader truck from Switzerland but the cabin looks like a bus front chassis number 510E20663. Any information or details on this please or where to find out where it was built. Interesting to see these as I wouldn’t have recognised them as T.Traders. However I have just seen another picture, for which I can only supply a link as it isn’t mine, which shows a bus with a conventional T.Trader lorry front panel. http://tinyurl.com/ picture number 62. I found this via the PSV Circle Photo Archive section 2. That Trader with the lorry front is a must for the ugly bus page! You were ahead of me there, Phil, for it being a contender for an ugly bus: it seems to look worse than on the lorry version. I recall that the lorries always had a badge with 4D on the side, denoting, I assume, a 4-cylinder diesel engine. It always sounded rough! I hope the coach had a more appropriate engine than that! 4D is also a pun, Chris. FourD/Ford. The beauty and simplicity for small operators was that parts and maintenance was cheap because of interchangeability with the lorries (not trucks!!!) which were produced in far larger numbers. The engine and gearbox would therefore be identical. I heard it said that one reason Ford got off to a good start in and after 1958 was that their diesel engine was smoother and quieter than the Bedford. It is certainly true that the Leyland option was always superior to the Bedford when choosing diesel and that Bedford never achieved with diesels the smoothness and superiority achieved with their petrol engines in either the OB or the SB. This is maybe why Salopia had their unique VAM3 coaches – with the 330 petrol engine more commonly found in the SB3. The Thames Trader 570E had a 6-cylinder engine which, as David says, was "sweeter" (in the words of more than one owner-driver I have met) than the equivalent Bedford. It therefore goes without saying that it was also "sweeter" than the 4D, whose main objective always seemed to be to shake its vehicle to pieces during tickover. There were lorries with the 6-cylinder engine as well, badged as 6D, but I think they were produced in far fewer numbers. Even in my younger, more naive, days, I’d twigged the pun, but only thought about it AFTER I’d sent the post. Thx for clarifying the engine type as 6D and for confirming my belief that the 4D engine was as unrefined as it sounded! Maybe its origins were from a Fordson tractor! I am the Grandson of Henry Freeman Sarjeant the late proprietor of Sarjeant Brothers Buses of Cheriton. I noted with interest the mention of that firm in the post about Fieldsends coaches and the sale of one of their coaches to Sarjeant Bros. When my grandfather died, my Grandmother in her grief burned all records of the firm along with many family photographs. I wonder, would anyone have any photographic records of Sarjeant Bros buses? The company was sold to East Kent Road car Company in June 1953. John – the vehicle in the photo you linked to belonged to Sargeants of Kington in Herefordshire, whereas the Sarjeants referred to above were in Cheriton, which is in Kent. So I rather doubt that there is any connection, other than the similarity of the sound of the name! I have a photograph of Bedford OB LKM 55 in Sarjeant Bros. livery at Folkestone en route to Dymchurch via Hythe. The photograph is copyright of J.T. Wilson. I am happy to send the spare photo I have to Ian Sarjeant. I also have photos of EBA 857 the ex-Fieldsend OB acquired by Sarjeants and subsequently sold to East Kent with LKM 55. The pictures of EBA 857 are all in East Kent livery. The discussion on Leigh-on-Sea, Essex is of interest. My grandfather owned Victoria Coaches and I remember the parking lot with 120 coaches at the top of Elm Road in Leigh. I recall the Fieldsends and Plaxton names from when my father Phillip Parsons ran the company for grandad. Any further information on this connection would be of great interest to me.